Put the world in your pocket with the Grundig Mini World 100 PE. 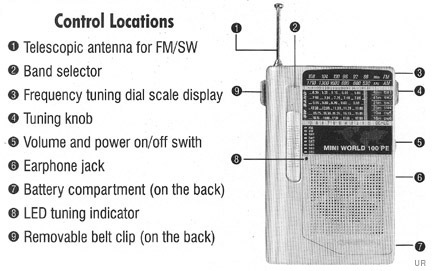 This affordable portable receives AM (530-1710 kHz), FM stereo (to earphone jack) and six shortwave bands: 5.8-6.4, 6.9-7.5, 9.4-10, 11.65-12.15, 15-15.65 and 17.5-18.14 MHz. 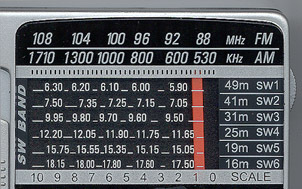 The analog dial indicates the tuned frequency. An LED tuning indicator is featured. Here is an inexpensive way to put the world in your pocket. 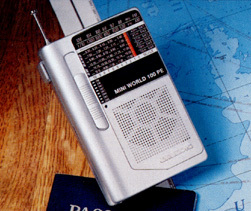 Hear major shortwave stations from around the globe. The Mini World 100 PE includes a vinyl carry pouch and stereo earbuds. Requires two AA cells. Titanium colored cabinet. 2.7 x 4.2 x 0.8 inches 6 oz. (69x107x21mm 170 g). What a great value! All Grundig shortwave radios feature a one year limited manufacturer's warranty. Click here to view Owner's Manual [PDF 430K}. 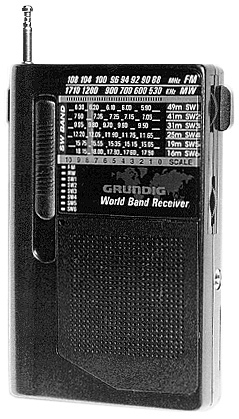 The earlier Grundig Mini World 100 was black instead of silver.